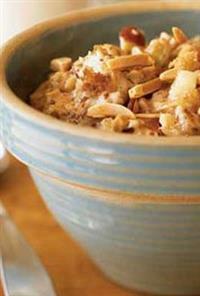 One of our favourite breakfast recipes here at Eureka Market Foods is our Apple Oatmeal. This recipe is not only great tasting, but it is also suitable for those on Vegan and Vegetarian diets. Featuring only 417 calories per serving along with 12g - almost half you recommended daily intake of fiber, this recipe is both delicious and super Healthy. The ingredients are: one and a half cup water, three quarters cup of steel cut oatmeal, pinch of salt, half a teaspoon cinnamon, half a cup of milk - any milk of your choice, half a cup of chopped dates, half a cup of slivered almonds and one grated apple. Once you got the ingredients ready, bring the water to a boil in a saucepan. Then add the oatmeal, cinnamon, and salt. Afterwards, cover, reduce heat to low, and simmer until liquid is absorbed - about 10 minutes. Stir in remaining ingredients and serve while hot. Please use the Contact form on the right for 15min Recipe - Apple Oatmeal information and ordering. Your message will be sent to The Eureka Market only. Privacy & Anti Spam protected.